A 55-year-old Royal Panda player has crammed her wallet with a £64,961 cash prize. 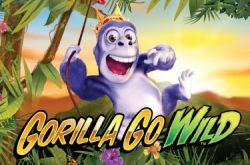 Caroline, whose last name is being protected, was spinning the reels of the Gorilla Go Wild slot when she struck oil. And the best thing is: She didn’t even use her own money as she benefitted from a cash drop thanks to her Silver status in Royal Panda’s loyalty program.